Christmas is coming, THE chocolate season of the year. So most us buy, eat, and give away a LOT of chocolate over the next couple of weeks1. Which is great! Just try avoiding the most common dirty tricks in selling chocolate to make sure you really get something that’s worth being praised as ‘chocolate’. This is nearly identical with leveling down wages for raw ingredients, which will ultimately also lower the ingredient quality. The main ingredients of chocolate are cocoa mass and cocoa butter, sugar, and milk powder when making milk chocolate. 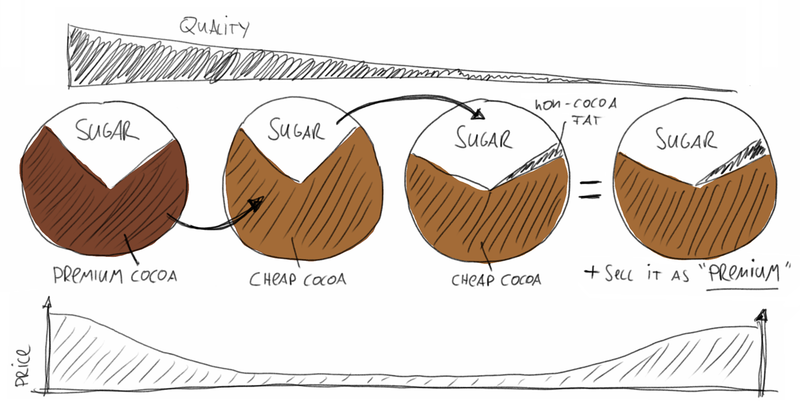 The cocoa components are clearly the most expensive ones, so that lowering their price has a big effect for the producer’s profit. Cocoa is a delicate tropical plant which is still harvested manually. Also the first processing steps (fermentation, drying) are mostly done by hand. There is no way that you can expect that premium cocoa was used when buying cheap chocolate3. Be willing to pay a fair price (cheap excellent chocolate does not exist). No 100% guarantee for best quality chocolate. But chocolate that is sourced from “single-origin” beans, or that is manufactured “bean-to-bar” fairly often qualifies as a high quality product. One of most typical examples is that of increasing the sugar content (sugar is cheap) and reduce the amount of chocolate mass, cocoa butter, or nuts (all more expensive). Very common for many bulk chocolate and candy bars. And -as I wrote some days ago- in chocolate Santa Clauses. Does the ingredient list contain items such as ‘vanillin’, ‘aroma’, ‘butter fat’, ‘vegetable oil/fat’, or more then 30-40% sugar (except maybe white chocolate)? Then the chocolate is most definitely total crap! That’s arguably the nastiest trick when selling chocolate. It often is surprisingly difficult to avoid fake premium chocolate or bonbons. They are typically presented and packaged as premium product and -of course- ask for a premium price. And those fake products come in all shades of gray. In the best case it is still a product of decent quality although sold under wrong premises. Typically this means creating an impression as if the product was entirely manufactured locally (while in reality it comes from a huge factory in -say- Belgium). In other cases, the product is only marketed as ‘premium’, but contains cheapest mass produced chocolate (such as the Lindt case I mentioned). Pretty tricky to avoid. Best to trust you palate and your senses (but that often means the product has already been purchased). Ideally you have a local chocolatier or chocolate shop that you can trust. That’s the safest way to get a real excellent product and to support the ‘real’, honest makers of premium delicacies. Take care: terms like ‘handmade’ do not allow to distinguish between ‘everything made by hand, right here, by us’ and ‘we just repackaged the chocolate bar by hand’. Just to makes things clear: reducing costs and making productions more efficient if of course not a bad thing in general. Reducing waste, better researched and understood processing, or large scale (or even mass) production can be fantastic ways to save costs without necessarily having to sacrifice quality. So that’s all fine with me. Many nasty ways to reduce production costs and quality of chocolate although the selling price does not scale accordingly!